In my last article, I pointed out the similarity between the seventh virtue, cleansing evil thoughts and the second virtue, selfless mind. 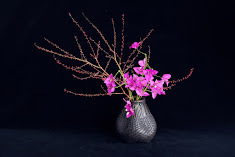 It is true that both virtues are about the calming effects of Ikebana, but there is a small difference if you look into their definitions closely. In looking into it, the hidden essence of Ikebana may reveal itself. Among the ten virtues of Ikebana, there is another virtue that refers to the effect of Ikebana on psychological states. That is the third virtue, pleasure without words. I was surprised to find that these three virtues are closely related on this level. Just think about Mamemaki. “Evil, Out; Fortune, In” is the phrase people use to celebrate this annual event. “ Evil, Out” means in essence cleansing Kegare, or impure states and this is the same as the seventh virtue, cleansing the evil thoughts. Once Kegare is cleansed, we reach the neutral state of Ke. “Fortune, In” means to bring the cerebrated state, Hare. This is the process similar to the change from pleasure without words to selfless mind. In short, behind these three virtues of Ikebana relating to the psychological states is the theory of celebration in Shinto. This will be a small part of my master paper in fine arts, which I will complete at the end of next year. Although some people argue that Shinto is a folk religion compared to some world religions such as Christianity or Buddhism, its cultural significance should not underestimated in any way. This is a work I made for a casual wedding reception at our home. My work was nice backdrop for wonderful dishes made by the groom who is a chef at Hanabishi restaurant. Since Christmas is close, I added holly leaves, red berries and vines painted silver. I used floral foam to fix the flowers.